Arrington suffered a fracture in her back, several broken ribs and she will have major surgery to remove portions of her small intestine and colon. South Carolina lawmaker Katie Arrington, who defeated U.S. Rep. Mark Sanford, R-S.C., in the Republican primary for his seat last month, was seriously injured in a car crash Friday night after a vehicle traveling the wrong direction struck her car, officials said. The driver of the vehicle that struck Arrington's vehicle died, a sheriff's department spokesperson said. Campaign adviser Michael Mule said that Arrington, 47, a state representative, was on her way to Hilton Head, South Carolina, for a Saturday morning event when the other car struck her vehicle head on. According to a spokesman, she suffered a fracture in her back, several broken ribs and she will have major surgery to remove portions of her small intestine and colon. Because of the accident, a main artery in her leg also partially collapsed and will require a stent. 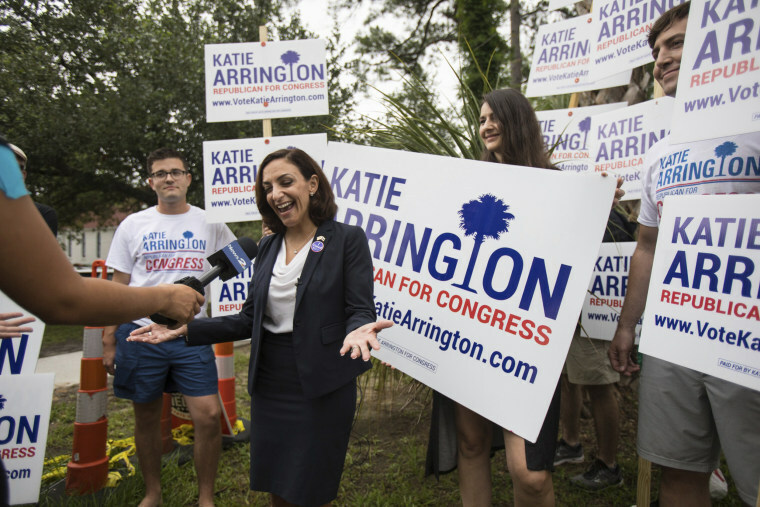 In the late afternoon, Arrington's campaign said the South Carolina lawmaker remained in critical but stable condition. She is scheduled to undergo a major surgical procedure on Sunday. Earlier in the day, her spokesman said she will require multiple surgeries and stay in the hospital for at least two weeks. "As we all know, Katie Arrington is an extremely strong woman and has tremendous faith and an incredibly supportive family," her spokesman said. "And it is from her strong faith, the support of her family, the prayers and support of our community, and the incredible doctors and staff at the hospital that she is certain she will be back to work for our state soon." The Charleston County Sheriff's office said the accident occurred around 9 p.m. ET Friday on U.S. Highway 17. The driver of the other vehicle died at the scene, the office said. Arrington and another person in the vehicle she was in, Jacqueline Goff, 59, sustained serious injuries and were transported to a hospital, sheriff's Capt. Roger Antonio said. The Associated Press reported that Goff was driving that vehicle, and described Goff as a friend of Arrington's. Sanford, who had never lost an election until Arrington defeated him last month, sent his thoughts and prayers Saturday. Her Democratic challenger Joe Cunningham said he was praying for Arrington and would suspend his campaign for the foreseeable future. The president and South Carolina Sen. Tim Scott also expressed support Saturday morning. My prayers are with Katie Arrington and her family this morning, as well as the families of the others involved in last night’s crash. Arrington’s campaign said her family asked for the public to pray for the person killed and for Arrington’s speedy recovery.